The easy way to get lawn mowing and more from the top lawn pros in Newnan. Everything looks great! Mowed, edged, and blown all using an app - this service is fantastic. I will continue using LawnStarter. In fact, I already have my first landscape service scheduled! Daniel came (in the rain ) got the job done. He didn't complain and was very polite. The service was OUTSTANDING!!! I didn't need to tell him anything. He was an asset to me. Thank you and thank Daniel!!! Thomas and Lee went above and beyond for my first mow with them. From helping pick up my kids' toys to gathering items that were headed to the garbage, they took great care of us today. I was impressed by their professionalism and communication. We currently have no rainfall data available for Newnan, GA.
Wesley is the founder of Wesley Levingston, a experienced landscaping service in Newnan. He has earned a 4.6 / 5 star rating on the LawnStarter platform. In addition to lawn care, Wesley Levingston provides yard clearing, tree care, and more. 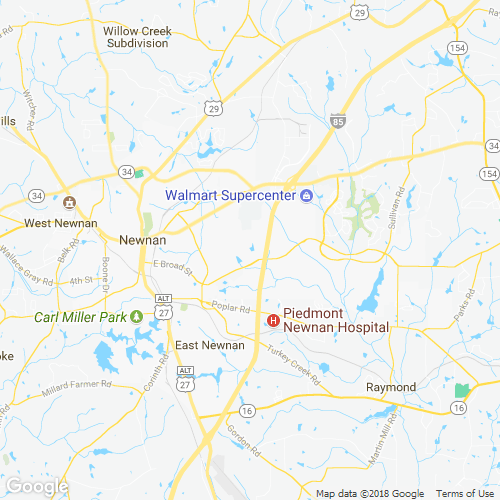 Jeff Klugman, owner of Lawn Enforcement, serves customers all over Newnan, GA. Customers often describe him as reliable, professional, and timely. My yard looks great! I would love to have Gabriel as my regular crew! Great job, please send Byron for my next lawn service. Thanks Byron.. Thank you for coming on short notice. Couldn't reach back yard due to gate size. Single person width clearance. Thank you for blowing the leaves off the back porch!! I forgot we had trees in that mess. He helped me save many plants. Dwayne does an excellent job. Ask for him if you want terrific service. As always Derek does a great job! Oak Tree Lawn & Garden Inc.
Mary done a fantastic job ,much better than the other person did previous times before. Cut short next time...back yard needs more work for next time. The yard looks nice and thanks for the tip concerning watering the lawn. Today's grass length was the best it's been from the start. We prefer the crew that came today. They were very nice. Great job! I was very pleased with the result. Eric's crew were friendly, professional, and fast! Looks great! Thanks so much!! Chestnut Lawn And Landscape LLC. Quick and efficient just what I expected. Thank you Scott! Did a great job. Thank you! LawnStarter pros will let you know what your lawn needs. Here are some recent recommendations for extra lawn services in Newnan, GA. Description: Front yard This estimate is for removing the weeds in the front flower bed and putting down 1 yard of mulch. Description: Front yard Front yard flower beds clean up and add mulch and trim shrubs including the one on the drive way. Work includes all material labor installation and trash away. Description: Front yard, Right side Trim front bushes. Weed and spray front garden. Description: Full yard I will milch the rest of your beds for that price not including price of mulch if interested? Serviced by: Oak Tree Lawn & Garden Inc.
Work to be Done: I would like to know if you would be able to remove the fruit tree (stump as well) and how much it would cost? Items Needing Service: Trim back bushes on property. Serviced by: Chestnut Lawn And Landscape LLC.